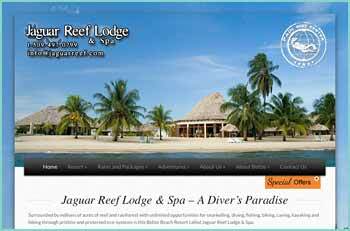 Surrounded by millions of acres of reef and rainforest with unlimited opportunities for snorkelling, diving, fishing, biking, caving, kayaking and hiking through pristine and protected eco-systems is this Belize Beach Resort called Jaguar Reef Lodge & Spa. This Belize beachfront resort is a haven of relaxation with a spa treatment set in a serene, calm and refined atmosphere. It offers amenities such as, beachfront accommodations, beachfront dining, kids swimming pool, pool with swim up bar, tiki bar, lounge bar, hot tub, spa, kayaks, bicycles, PADI 5 Star Center and water sports adventures. Jaguar Reef Lodge is a proud member of the ViVA BELiZE Hotel Group, owned and managed by Canadian & Swiss Hospitality Pioneers for the past 20 years, consists of six intimate, full-service Belize Resorts, committed to provide an exceptional hospitality experience with one outstanding island, three superb beach and two exclusive rainforest properties, that can be booked separately or combined into one exciting beach & jungle vacation.